Proud to help make a difference one gift at a time. 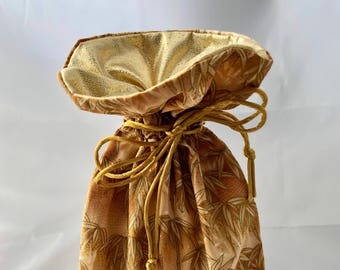 Announcement Stay tuned as we upload additional limited edition elegant fabric gift bags in different sizes to our collections of Beach Towel Bags and Blanket Bags. Plus new in January ... special bundled collections as well as fun and new helpful products coming later in 2018! Special care and shipping provided by important community members at our local Vocational Rehabilitation were the motto is ... "Let's go to work!" Thank you for visiting my new store and stay tuned for special sales and coupons. Many items already include Free Shipping! 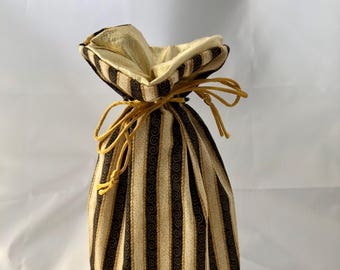 Stay tuned as we upload additional limited edition elegant fabric gift bags in different sizes to our collections of Beach Towel Bags and Blanket Bags. Plus new in January ... special bundled collections as well as fun and new helpful products coming later in 2018! Exactly as described and a great size. Very soft, cozy material. Love it! Nice quality and great looking fabrics! Doing shows was often a family affair - help from family members was always appreciated! Photographing my wine glass holders continues to be a challenge. Look for them in my store later in 2018! I’ve developed methods for individuals with special needs who need work to help with ribbon cutting, packaging, etc. Glad the traveling craft vendor days are finally behind me --- thank you ETSY! Making a difference ... one gift at a time. 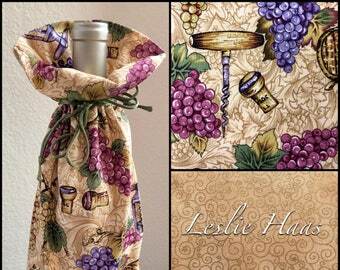 The idea for my wine bags originated while living in the wine country around Richmond, Virginia. Originally branded as "It's In The Bag!" 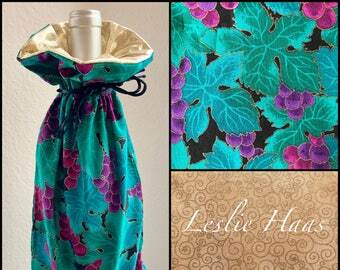 I have since added so many different products that I've settled on "Leslie Haas Designs" for my Etsy store and have moved to the Lowcountry of South Carolina to be near two of my sisters. 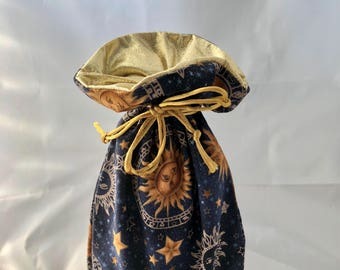 One pet peeve of mine has always been not liking waste, so I designed my line of fabric gift bags as a great way to avoid environmentally wasteful paper gift wrap and paper bags. At the same time, customers kept agreeing, "presentation is everything!" 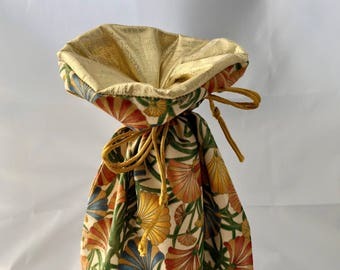 While the fall craft shows and winter holidays were always busy, I needed a spring and summertime product line so expanded to beach towel bags, picnic blanket bags and then --- bingo! --- the lovely 'scraps' leftover from the cuttings became the main hallmark of my first patented product --- the unique 'Very Boberry 'Eat Drink & Be Merry'' Wine Glass Holder necklace that you wear! Seeing the huge potential, I set up shop at many more wine festivals and juried craft shows on the east coast and eventually met Richard and together we tweaked my water bottle carrier design into a simpler, more efficient version for which we earned two additional patents and named it "Sport Your Drink" --- numerous prototypes were designed and eventually assembled with care ourselves and sometimes with the help of individuals at local workshops that assist individuals with life challenges and job training. We plan to partner with local Vocational Rehabilitation workshops to help with order fulfillment as well as making of *future* products. 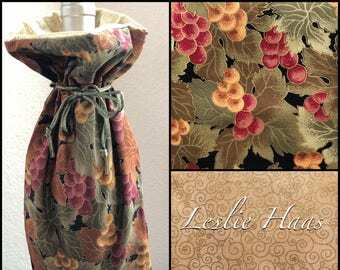 In the meantime, I'm happy to have this new Etsy store which will be my 'virtual' vendor booth where I hope you'll like my Beach Towel Bags, Blanket Bags and Fabric Gift Bags. 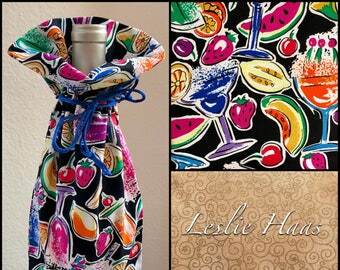 In the future I will even be listing some of my leftover fabrics so that I can continue with my volunteer activities with the "Eat Smart, Live Longer" club in Sun City Hilton Head, as well as teach nutrition and cooking classes as a certified "Food for Life" trainer and health coach for the new "PlantPure Health and Weight Loss" classes in the Lowcountry. 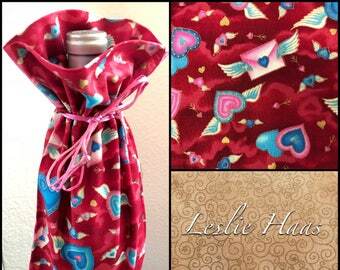 Thanks so much for your interest and for supporting products handmade in the USA! Whether I'm chopping, slicing, dicing and cooking up a new healthy menu, I'm most likely also cooking up a new product idea too. Or else I might be out riding my unicycle in our neighborhood and dreaming up a better way to make a better mousetrap. The South Carolina Vocational Rehabilitation Dept. prepares and assists eligible residents with disabilities to achieve and maintain competitive employment. "Let's Go to Work" is their motto. I'm grateful to work with their skilled staff and clients! To offer previous customers a promotional coupon from this store based on prior purchases. We will NEVER share your information.